It may not be pet heaven, but the cemetery high above east Napa can seem to be in its foothills. Two steep and serpentine miles up Atlas Peak Road, Bubbling Well Pet Memorial Park is the final home for hundreds of dogs, cats, rabbits, birds and other animal companions. Twenty-one wooded, manicured acres overlooking the Napa Valley are dotted with plaques and markers bearing the names of family members no less fondly remembered for having walked on four legs rather than two. A first glance across the grounds suggests a regular, human cemetery, down to the flower bouquets dotting the lawns and the cottage-like chapel, equipped with an upright organ, a short stroll past a lemon tree. It takes a closer look at details to notice Bubbling Well’s unique clientele. The names on the markers are breezier — a Fluffy and Windy here, a Duffy and Otto there — and the lifespans rarely much longer than a decade and a half, but the sentiments underneath them often carry emotions as weighty as those felt for human children. On a weekday afternoon, a visitor can stroll among the graves, and past the twin-pillar mesh sign dedicating the park to bereaved pet owners, amid a silence only faintly broken by distant birds. But all is not solemnity in the park; dog- and cat-shaped benches and scrap-metal sculptures hint at a playfulness and ease foreign to most places for the human dead. For more than four decades, the Harberts family has handled the burials and cremations of more than 12,500 pets from across the Bay Area, from gerbils to a lion at the Folsom zoo. 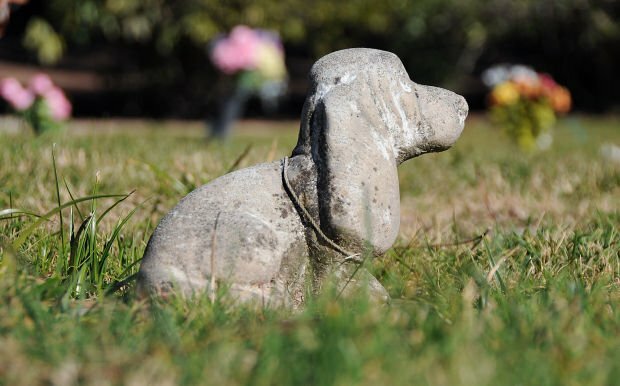 Their cemetery was spotlighted more than 30 years ago in the Errol Morris documentary film “Gates of Heaven,” which shone a spotlight on Bubbling Well, the pet owners bringing their lost companions there — and the parents and sons who built and nurtured the park. His is a determined, if quiet, commitment, but also hard-won. The family’s road to Napa began in a human cemetery, an ocean away in Hawaii. Cal Harberts was managing the Mililani Memorial Park, a graveyard on the island of Oahu, in 1961 when he and his wife Catherine, known as Scottie, visited his two brothers in Berkeley. During a day trip to Napa, the couple was lunching at the Silverado Country Club when a visitor told them about a 50-acre gentleman’s ranch that was on sale up Atlas Peak Road. But it would be a decade before the old ranch would take on its new role, as Cal Harberts raised a few cattle there while selling real estate in Lake Berryessa. It would take a revelation about the shabby treatment of dead pets to jump-start his dream of turning the hillside spread into a burial ground. Stories by the San Jose Mercury News in the late 1960s called attention to the dogs and cats veterinarians routinely took to Dumpsters, or to rendering factories that boiled their carcasses into fats or animal feed. The resulting outcry proved the best advertising for Cal Harberts, who used the newspaper clippings to convince numerous vets to send deceased pets to his new memorial park. Pet ownership was surging in the years after World War II, and in the affection more people lavished on their animal companions, Dan’s father detected a need in the making. “The story Dad used to tell me was that he would go to grocery stores, and he’d compare the pet food aisle with the baby food aisle — and he could see there was much much more in the pet food section,” he said. Bubbling Well opened in September 1971, its first grave the last home of a dog named Tanya. In addition to individual burials and cremations, the new pet cemetery arranged communal burials, a practice Cal Harberts borrowed from Midwestern burial grounds and promoted as a less expensive but still respectful final outcome. Meanwhile, as the family drew more pet remains to the Napa Valley in the mid-1970s, events 90 miles to the south began to throw national attention to Bubbling Well. Near a then-isolated stretch of Interstate 280 in Los Altos, a wheelchair-bound North Dakotan named Floyd McClure opened the Foothill Pet Cemetery, which soon became home to 450 animal graves. But a city rezoning for residential use triggered a spike in real estate prices, and the landowner leasing the cemetery grounds to McClure ordered him to clear out — and have the pet remains reburied in one small corner of the property to make room for new houses. Outraged pet owners brought their grievances to Bay Area media, and the news soon reached Cal Harberts, who in 1977 agreed to inter the orphaned remains in a new plot at his own cemetery. The battle and passions over the doomed Foothill graveyard caught the eye of Errol Morris, then a film student at UC Berkeley. Sensing a drama in the making, he put together a film crew to interview McClure and his business partners, then Cal Harberts, his wife and their two sons — Dan and his older brother Phillip, both then working for their parents. As the cameras rolled that summer, Morris revealed tensions and conflicts in the hopes and dreams of father and sons. “Surely at the gates of heaven, an all-compassionate God is not going to say, ‘Well, you’re walking on two legs, you can go in. You’re walking on four legs ... we can’t take you,’” Cal Harberts said in the documentary while explaining his park’s mission. While the placid and white-haired father exuded quiet confidence in his work and its worth, the interviews of his sons showed them grappling with the direction of their own lives. An insurance salesman in Utah before emotional burnout sent him back home, Phillip regaled visitors with the “R2A2 method: recognize, relate, assimilate and put into action” he had taught in motivational classes, and carefully arranged on his desk the trophies garnered during six years of hitting sales targets. On film, however, his glassy-smooth persona formed an uneasy match with images of the onetime sales star mowing the cemetery grounds, shirtless, under an unremitting sun. His refuge from the cemetery’s daily routine often took the form of an electric guitar on which he recorded songs to an open-reel tape recorder — or crunched chords outside after closing time, the notes blasting from his amplifier and across the valley. The fruit of Morris’ interviews was the documentary “Gates of Heaven,” which debuted in 1978. Movie critics praised the non-narrated documentary for its deceptively penetrating insights into pet burials, human bonds with their dogs and cats — and the hopes and fears of those working to help the pet owners. For Dan Harberts, the insights sometimes cut too deeply, as he realized when his family was invited to an early showing on the Berkeley campus. Ultimately, though, seeing the peace the owners received from giving their animals a proper send-off gave him a deeper appreciation of the picture painted by Morris. While “Gates of Heaven” gave Bubbling Well a fame unique among pet cemeteries, life went on much as before on the Atlas Peak grounds in the years after the film’s release. What became a cult sensation and curiosity to film buffs and animal lovers elsewhere remained a job at Bubbling Well, though an increasingly prosperous one. 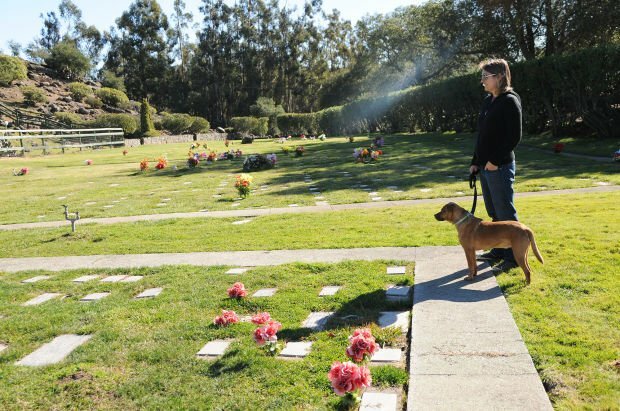 More veterinarians signed deals to send deceased animals to the memorial park, and in 2006 Dan Harberts repeated his father’s gesture from decades earlier, taking in 1,000 graves left in limbo after the Pet’s Rest cemetery in Colma lost its lease. Where two square sections of graves faced the valley in the 1970s, four now lie — with hundreds of others occupying the lawns to the west. Nevertheless, cremation has come to account for 95 percent of the park’s funeral arrangements, a trend Harberts said mirrors the increasing transience of jobs and families moving more frequently than ever, and often wanting to take their animal friends’ cremains wherever they go next. Those whose pets have recently died usually contact Bubbling Well through a local veterinarian, according to Harberts. The cemetery’s staff arranges pickup of the remains and discusses with clients whether to choose burial or cremation, the choice of marker, casket or urn, and the kind of graveside or chapel observance for the animal. Owners’ ways of remembering their pets can range from a few simple reminiscences over the coffin to the pageant one woman arranged for her deceased poodle 30 years ago, with 30 friends and relatives at the cemetery and the woman’s pastor brother presiding. A Bubbling Well staff member joins the owner, but only as an observer and sounding board, according to Harberts. “Some people are very quiet and solemn, and others are very conversational and want to talk about their pet,” he said. A year after “Gates of Heaven” debuted, Phillip Harberts left for a corporate headhunting career as remote from the pet park as his new Los Angeles-area home was from Napa. In a telephone interview from his Northridge home, the 65-year-old Harberts admitted being captured in a vulnerable time. But unlike his younger brother, he declared himself at peace with his younger self. Aside from reading the occasional email or letter asking if Bubbling Well is still run by the same family, Dan Harberts — his once wavy brown hair thinner and grayer, dreaminess replaced with the calm of years — appears to have adopted the same plainspoken earnestness his father once exuded. In a section of graves called the Garden of Memory, one of Bubbling Well’s oldest plaques captures in a sentence the mix of cuteness and heartfelt sentiment that has made the cemetery, and others like it, possible. Pretty cool. What a special place.